Sorry Mom2, I ruined the surprise, didn't I? The slouchiness came out exactly as I wanted it, so I think I just need to adjust the number of stitches I cast on and I’ll probably use a size or two smaller needle than before. 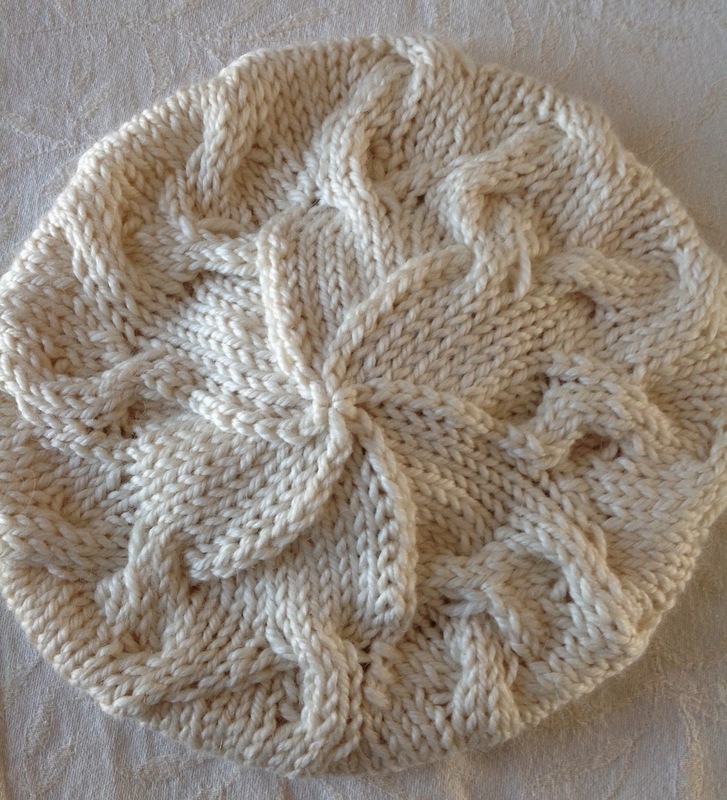 The pattern is a freebie, the Star Crossed Slouchy Beret by Natalie Larson. The pattern calls for Aran weight yarn, but I used a super bulky (Katia Peru) and I thought I’d adjusted my needle size appropriately but I’ll have to have another go at it. I like the pattern and it’s helping me work on my cabling (which needs a lot of work if I’m ever going to be able to knit myself an I Heart Cardigans by Tanis Lavallee—which I simply MUST do). Since I’m on a hat kick recently, I decided it was time to invest in a few 16” circulars (I had none) so I ordered a few sizes I thought I’d use a lot from KnitPicks. I’ve used their fixed circulars before and they are a perfectly adequate and affordable option for fixed circulars. I knew before ordering that the needle tips would be shorter than what I’m used to, but was really unprepared for how different it would feel to actually knit with them. I’m getting used to it, but I am SO glad that when I ordered my Addi lace interchangeable set, I opted for the longer needles rather than the original short ones. I have a way of gripping the right needle with my entire hand and I’m used to feeling the tip with the edge of my hand and not the cable. It kinda throws my knitting mojo off. I have a couple of other things on the needles right now that I can’t quite share with you, but will be posting about them soon. On another note, my mom had been here with us since Christmas but yesterday we drove her to the airport for her trip back to Ohio. I miss her already but haven’t quite convinced her to move down here (yet). While on our way to the airport in New Orleans, I sustained some damage to my vehicle when some cars in the next lane kicked up debris that LDOT hadn’t picked up. This is the second time I’ve had more than minor damage to my vehicle on Louisiana highways from debris. The first time it was a cracked windshield that had to be completely replaced. This time, I have a cracked headlight and some major scuffing on the front of the car. To say I am not happy would be an understatement. >:-/ I’m hoping most of the scuffs rub out but I know the headlight is going to cost me. Well, The Husband just bribed me away from my computer by offering me a trip to the sushi restaurant. We haven’t been in ages, so I’m off. I have a very short circular needle that I use a lot for hats. I agree the shorter tips take time to get used to. I just tell myself that the advantages of being able to make a hat without a seam outweigh the discomfort. I hope I am actually able to get used to them and that they don't feel strange every time I use them! I was using DPNs, which is okay, but I don't have ones long enough to work the latest slouch hats without dropping a stitch.